the world at large. Similar symbolism exists for other tools. The All-Seeing Eye is an important symbol of the Supreme borrowed by the Freemasons from both the Hebrews and the Egyptians. It appears as though the all-seeing eye was selected as an organ as the symbol of the function which it is intended. Similarly, the foot was often adopted as the symbol of swiftness, the arm of strength, and the hand of fidelity. The All-Seeing Eye could then be considered as a symbol of God manifested in his omnipresence and preserving character-to which Solomon alludes in the Book of Proverbs (xv, 3), where he says: “The eyes of the Lord are in every place, beholding (or, as in the Revised Version, keeping watch upon) the evil and the good.” It is a symbol of the Omnipresent Deity. Within the Degrees of Masonry there are found references to the plumb and plumb-line as instruments of particular significance to the Mason. One of the earliest and simplest instruments used in construction, the plumb and its line were an essential tool of the stone mason. As the level was to insure evenness of a surface, the plumb was to insure perpendicularity and right angles to that surface. A simple plumb is an instrument of amazing accuracy. From homes to cathedrals, this simple tool has pointed the way upward and indicated the straightness needed to obtain perfection. And so it is that this tool was taken from the operative mason to the speculative mason as a symbol of the best off conduct, unequivocal uprightness, and constant integrity required to build a spiritual temple reflective of the best of one’s efforts. So, it is that when you hold a plumb and plumb-line in your hand, you hold a working tool of Masonry. The plumb line shown on the Masonic Ring above is an example of a Master Mason Ring found at Fox Jewelry. Within Freemasonry, the color blue is a symbol of universal friendship and benevolence, as it is the color of the vault of heaven. Blue is the only color other than white which should be used in a Master’s Lodge for decorations. Within the Blue Lodge are conferred the Craft Degrees. These Masonic rituals represent three degrees which are taken in sequence. First, the Entered Apprentice Degree, second, the Fellow Craft Degree and finally, the Master Mason Degree. 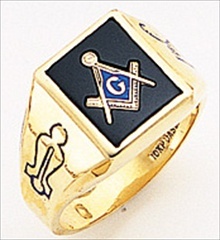 Examples of a Blue Lodge Ring or Masonic Ring can be found at Fox Jewelry. While there probably are some actual stone-workers who are Masons, Masonry does not teach is membership the literal techniques of stonework. Rather, it takes the actual ‘operative’ work of Medieval Masons and uses it as an allegory for moral development. Thus, the symbols of Masonry are the common tools that were used by medieval stonemasons: the gavel, the rule, the compass, the square, the level, etc. Each of these has a symbolic meaning in Masonry. For example, Masons are said to meet ‘on the level’, meaning that all Masons are brothers, regardless of social status, personal wealth, or office within the Lodge or in the world at large. Similar symbolism exists for other tools. Although it is not yet possible to say when, why or where Freemasonry originated it is known where and when “organized” Freemasonry began. On 24 June 1717 four London lodges came together at the Goose and Gridiron Ale House in St Paul’s Churchyard, formed themselves into a Grand Lodge and elected a Grand Master by the name of Anthony Slayer. The first few years the Grand Lodge was simply an annual feast at which the Grand Master and Wardens were elected. In 1721 other meetings began to be held and the Grand Lodge began to be a regulatory body. By 1730 it had more than one hundred lodges under its control (including one in Spain and one in India), had published a Book of Constitutions, began to operate a central charity fund, and had attracted a wide spectrum of society into its lodges. In 1751 a rival Grand Lodge appeared, made up of Freemasons of mainly Irish extraction who had been unable to join lodges in London. Its founders claimed that the original Grand Lodge had departed from the established customs of the Craft and that they intended practicing Freemasonry ‘according to the Old Institutions’. Confusingly they called themselves the Grand Lodge of Ancients and dubbed their senior rival ‘Moderns’. The two rivals existed side by side, both at home and abroad, for 63 years, neither regarding the other as regular or each other’s members as regularly made Freemasons. Attempts at a union of the two rivals began in the late 1790s but it was not until 1809 that negotiating committees were set up. They moved slowly and it was not until His Royal Highness Augustus Frederick, Duke of Sussex became Grand Master of the Premier Grand Lodge and his brother, His Royal Highness Edward, Duke of Kent, became Grand Master of the Ancients Grand Lodge, both in 1813, that serious steps were taken. The formation of the premier Grand Lodge in 1717 had been followed, around 1725, by the Grand Lodge of Ireland and, in 1736, the Grand Lodge of Scotland. These three Grand Lodges, together with Antients Grand Lodge, did much to spread Freemasonry throughout the world, to the extent that all regular Grand Lodges throughout the world, whatever the immediate means of their formation, ultimately trace their origins back to one, or a combination, of the Grand Lodges within the British Isles. Examples of Masonic Rings can be found at Fox Jewelry. Even More on the History of Freemasonry….. The Mysteries referred to below had rites of initiationwith trials to be passed before receiving knowledge, and secrets to be concealed. The secrets of these Mysteries were kept well enough that later ages can only guess at what some of them were. It is possible that knowledge of the nature of the Mysteries was in the hands of the founders of the Masonic order and gave form to some of the present-day structure of Masonry. The picture shown above is actually a picture of a 33rd degree Masonic Ring. As I become more involved in the study of Freemasonry, I think that it is fascinating to delve into the history of this grand fraternity. Although some Masonic brothers may take the ritual to be historical truth, there are no true Masonic authorities who give any credence to an actual organization of Masons in ancient times. What is known is that there were fraternal organizations of the ancient world, both among the pagans and among the Hebrews. In the former case, the organizations were generally connected with the so-called mysteries, of which the Eleusinian Mysteries that were among the best known.hat were celebrated until 395 AD when the walls of the sanctuary in Eleusis were breeched b Alaric’s hordes. For millennia before that, thousands of Initiates received a mystical experience. Revealing the Mysteries was considered punishable by death.The most prominent example of the latter is the group known as the Pharisees. Many examples of Masonic Rings can be found at Fox Jewelry.